I'm trying to convert VOB files into Quicktime. I'm using MPEG Streamclip but it's stuck halfway. Does anyone know the best VOB to QuickTime converter to smoothly convert VOB to QuickTime MOV formats in Mac? Thank you. VOB, short form of "Video Object", is used as a container format in DVD-video media. Generally, you will obtain it when you rip a video from a DVD. You see VOB files can be played by many players such as VLC, MPlayer, ALLPlayer and more, but QuickTime Player is an exception. Hence, in the event that you hunger for playing VOB files with QuickTime, you're required to primarily convert VOB format to QuickTime MOV on Mac. For the sake of processing VOB video files to QuickTime on Mac with ease, a superb and credible video converter is of the essence. 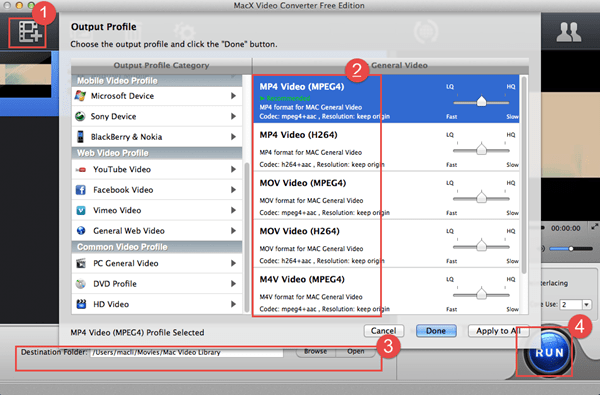 Here MacX Video Converter Free Edition is strongly recommended as the unparalleled VOB to QuickTime converter for Mac (El Capitan) to transcode VOB videos to QuickTime MOV with killer fast speed and amazing high quality. Best VOB to QuickTime MOV converter to compress & convert VOB to MOV 83X faster speed. Just simple clicks and you can play VOB on QuickTime and iPhone iPad no quality loss. This VOB converter freeware is not only designed as the top-notch yet free VOB to QuickTime MOV converter to compress and convert VOB to QuickTime MOV with much smaller file size on Mac but also the all-conquering program to convert almost all HD and SD videos like AVCHD, MTS, MKV to MOV, MPEG, 3GP, FLV to MOV, AVI to QuickTime MOV on Mac with 83X faster speed. More unbelievable, with this freeware, compressing and transcoding VOB videos to MOV for playback on your iPhone, iPad on the go is solely like a hot knife through butter and you can also import your VOB videos to iMovie or Final Cut Pro to freely edit them to your one-of-a-kind video clips. Free download this top VOB to QuickTime MOV converter freeware on your Mac and launch it. Then hit "Add File" button to load VOB files. Select the target format "to MOV" button. Besides vob to QT mov, you're also allowed to convert vob to mp4, mp4, mkv, avi, or vob to itunes, imovie and more. With this Mac VOB to QuickTime converter, you are allowed to adjust all the parameter settings to further compress and reduce the output video file size, like resolution, frame rate, bit rate, sample rate, etc so as to better fit your media player or portable devices. Slightly click the "RUN" button to start converting VOB to QuickTime MOV on Mac (Sierra/El Capitan), you can view the conversion progress and cancel the converting process at anytime. Notes: In addition converting VOB to QuickTime on Mac, for those who aspire to get more video conversion on Mac, download and convert YouTube videos for watching on iPhone, iPad, iPod, Samsung Galaxy, HTC, Xbox One offline on the move, MacX Video Converter Pro will be the incomparable choice and assist Mac users to accomplish all tasks flawlessly in a twinkling of an eye. This guide article will show you top three free video converters for Mac, and you will also know how to convert videos with these wonderful free video converters on Mac. Seeking for an easy solution to convert VOB files to AVI on Mac OS? Take it easy, this tutorial will show you how to convert VOB files to AVI format for playback on PSP, HTC, Samsung, etc with no sweat. This article is mainly about how to convert VOB files to MP4 format on Mac with the first-rate Mac VOB to MP4 converter, so that you can play VOB files on media Player or portable gadgets effortlessly.